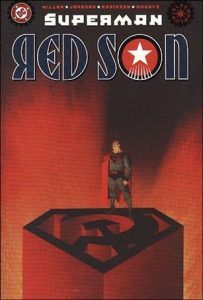 It started with an exchange between Mark Millar and Kong: Skull Island director Jordan Vogt-Roberts which saw the latter reveal that Warner Bros. had turned down his pitch for a Superman: Red Son movie but Den of Geek claims to have heard from “very, very, very reliable sources” that the studio is looking to bring the Mark Millar penned comic to the big screen at some point in the near future. It’s far from confirmed as happening just yet, but between the comments made by Vogt-Roberts and Millar and the site’s claims that they’ve heard it’s potentially in the works, the signs are looking good. Superman: Red Son is a very interesting DC Comics property to adapt and isn’t exactly the Superman tale we expected to see on the big screen next. Man of Steel 2 has seemingly been stuck in development hell for a while and it’s not clear right now whether Henry Cavill would play a Russian (and somewhat villainous) version of the character or if the studio would recast him and new versions of Batman and Wonder Woman. It also feels like an R-Rating would suit this property well.